Home Style Advice	What Color Should Your Dress Socks Be? When it comes to matching dress socks with dress shoes, there are a few cardinal rules to follow. First, white gym socks are never a good option. Second, always coordinate the color of your socks with the color of your pants, since the two are always seen side-by-side. Third, have some fun! The days of black socks for every occasion are over. So, what color should dress socks be? There’s a good chance that your pants are also black, or dark gray. If so, we love to see men choose a solid gunmetal gray for a classic, slight contrast. This combo is perfect for black-tie affairs, everyday office wear, or funerals. 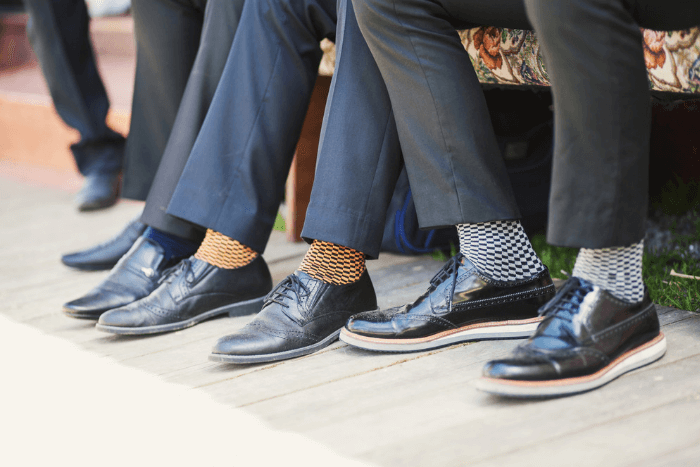 If the occasion is more upbeat, say an anniversary party or prenuptial dinner, we think patterned socks – stripes, blocks or dots – are a fun way to add personality to your look. Anything from a rainbow palette to your favorite colors works with black shoes and dark pants. 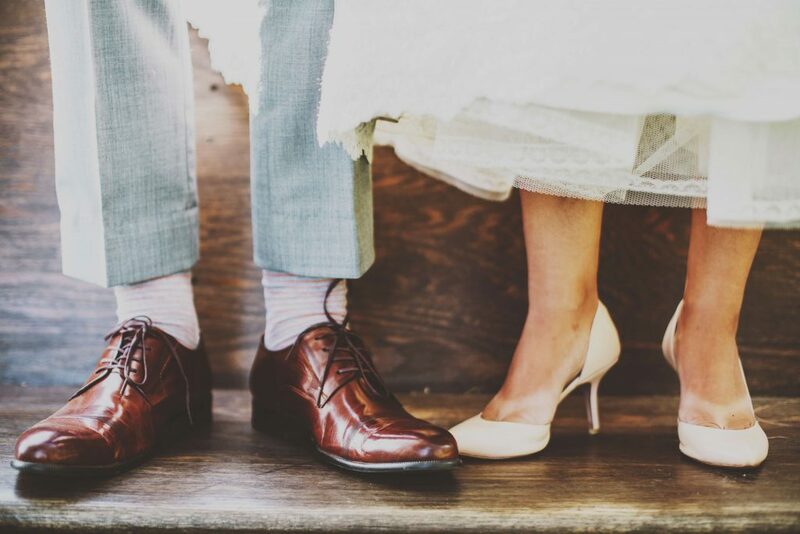 Dark or light, gray shoes set off blue, gray, taupe, or white formal wear perfectly. They provide a contrast that’s neutral but eye-catching. If the outfit features gray pants and gray shoes, we love to see a bit of color in the socks. A bold, bright choice such as yellow or coral is perfect for celebratory events. A neutral tan or black is better for professional or subdued gatherings. However, if those gray formal shoes are teaming up with a non-gray ensemble, go for a solid sock in a dark jewel tone. We love forest green, navy blue, or burgundy. Light tan to chocolate or even darker orange-hue brown shoes are the go-to for many men. They look good with gray, blue, white, and colorful dress pants. The only pairing that’s not so pleasing is brown shoes with black pants. When it comes to socks, again look to the pant color. We love to reflect a color from the pants in the socks, whether they’re patterned or solid. For example, a navy blue tuxedo could pair with argyle socks featuring three shades of blue (one being navy) for a sharp, modern look. 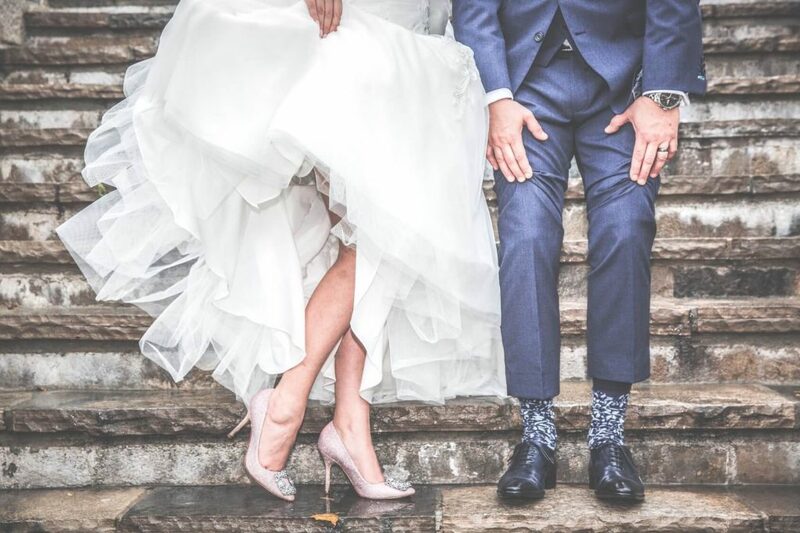 Let’s face it, some bridal parties or prom attendees stick with the ultimate in footwear comfort, even when they don a tux or suit. Although sneakers are informal, the occasion is not. Stay away from the urge to grab your everyday socks. Instead, choose a patterned or bold solid color that coordinates with your formal wear accessories or your date’s outfit. Yes, bubblegum pink or sports logo dress socks look fabulous. Just make sure they are tall enough to cover all exposed skin when seated. Need more sock inspiration? Browse the trending colors and patterns online at Jim’s Formal Wear.